Notice the "picture" on the front of this building. 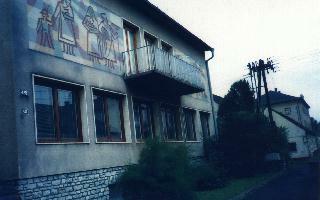 There were numerous homes with different "pictures" on them, and we wondered if there was any significance to them. 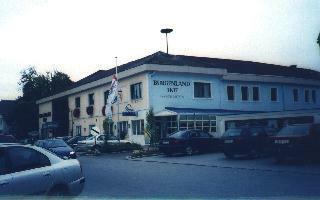 The Burgenland Hof Gastgarten. This is not the place to order a dinner for two unless you have a huge appetite! We did, and we could have fed four more people with all the food we got (what we did manage to eat was delicious). We noticed that the people eat a much more leisurely meal than we do. And the waiters/waitresses do not seem to be in any hurry for the patrons to leave, as they seem to be in the States.